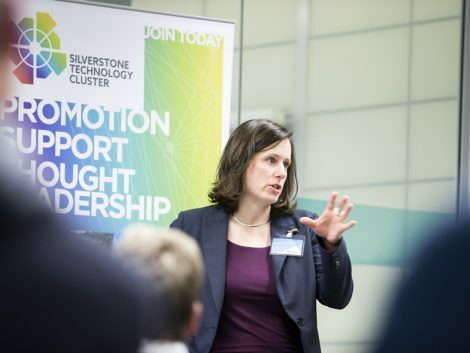 Roz Bird has been appointed Chair of the Silverstone Technology Cluster following a unanimous vote by its Board of Directors. Roz is the Commercial Director for MEPC’s rapidly developing high tech business estate Silverstone Park. However she was also a driving force behind commissioning research and a high profile report that identified that the one hour drive time radius around Silverstone is home to a successful high tech industry cluster (the STC) specialising in advanced engineering, electronics and software development. STC CEO Pim van Baarsen said: “Roz’s appointment adds strength, credibility and profile to the STC at a really important stage in its evolution. “She is highly respected within the business community, is very well connected and brings an innovative way of thinking to the table. “I already work closely with each and every Board member, they are all passionate about making the STC a success and each brings a unique perspective and experience to the discussions. Roz commented: “I was delighted to be asked to take on the role of Chair of the STC. Based on my experience of cluster organisations elsewhere in the UK I know that the STC has the ability to generate prosperity for the area and unlock the ‘latent potential’ referred to by the SQW report and acknowledged by government in the corridor report. “The STC is already bringing business people together in a meaningful way in our region and attracting the likes of Heathrow through the work the STC does to promote the many and diverse capabilities of the area to the rest of the world.